BELGRADE (Serbia), February 12 (SeeNews) - Serbian opposition said it has started a boycott of parliament sessions to support the spreading protests against what it sees as autocratic rule by president Aleksandar Vucic and the government led by populist conservative party SNS. The boycott is carried out by parties members of Alliance for Serbia, the organiser of the weekly protest rallies that have been held in Serbia since December 7, following the assault on Borko Stefanovic, leader of the Serbian Left party, the Alliance said in a statement on Monday. The MPs from the political parties that form Alliance for Serbia are demanding the resignation of the government and parliament speaker Maja Gojkovic, because they violated the laws and the Constitution several times, the deputy president of the People's Party, Miroslav Aleksic, said in the statement. "Opposition members will also boycott the sessions of local assemblies. And we will hold news conferences every half an hour at which we will talk about laws that are on the agenda. Let everyone know that from today there are two parliaments in Serbia - a violent, usurpatory one and a democratic one - who will be sitting in the hall," the leader of right-wing political party Dveri, Bosko Obradovic, noted. The 22 MPs of Serbian Radical Party (SRS) and the nine MPs of the coalition of the Liberal Democratic Party, the League of Social Democrats of Vojvodina and the Party of Democratic Action of Sandzak, which are not part of Alliance for Serbia, do not participate in the boycott. A total of 165 out of the 250 deputies in the Serbian parliament support the SNS government led by prime minister Ana Brnabic. Three opposition parties represented in parliament are members of Alliance for Serbia - the centre-left Democratic Party, Dveri, and the People's Party, with a total of 24 MPs. The Alliance for Serbia accuses SNS and Vucic of provoking the attack against Stefanovic, who was assaulted by a group of men on November 23 in Krusevac, in southern Serbia, and suffered injuries from being beaten with an iron rod. 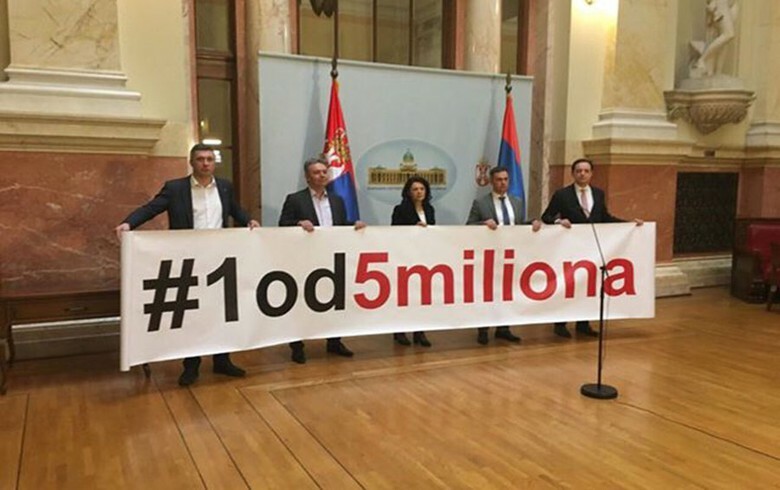 The rallies across Serbia are organised under the "One of five million" slogan referring to a statement by Vucic that he would not fulfill any of the protesters' demands, even if they were five million. The Alliance for Serbia was established before the local elections in Belgrade held in March 2018. The Serbian Left party, which is not represented in parliament, is a member of the alliance. Anti-government protests started spreading across Serbia earlier this month. On February 2 and 9, rallies were held in the cities of Nis, Novi Sad, Kragujevac and Cacak, in addition to Belgrade.